Amateur baking challenge. The bakers must prove their skill with pastry, making frangipane tarts, flaounes and vol-au-vents. With bread, biscuits and cakes under their belts, the bakers must now prove their skill with pastry. First, the bakers make frangipane tarts for their signature challenge - shortcrust pastry holding a silky-smooth frangipane cream. Fruit is the obvious addition, but one baker hopes that a pina colada-flavoured tart will win the judges' approval. Paul sets the technical challenge, a traditional cheese-filled pastry from Cyprus - the flaouna. The bakers are faced with ingredients they've never heard of that make a particularly pungent filling. Once the bakers have overcome the smell, they just need to work out what a flaouna looks like - a mini pizza, a Cornish pasty or none of the above? The show-stopper is the classic 70s canape, vol-au-vents: bitesize puff pastry that should be delicate, light and stuffed with tasty fillings. The bakers approach this challenge with trepidation; one refers to vol-au-vents as his nemesis. Getting the puff folded and chilled in time causes problems for more than one, but it's no holds barred when it comes to the fillings as the bakers choose an array of flavours and combinations that really impress the judges. 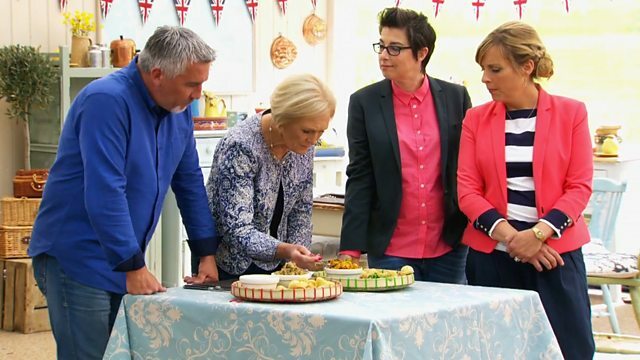 Find this week's technical, signature and showstopper bakes on the BBC Food website. "Feeling the presh with the puff"